In February 2018 the gold price was R494,365 per kilogram. Today it sits at R572,615 per kilogram. Subscribe Risk-Free for an Entire Year! Gold in rand terms R60,000 per kg higher than this time 2018! Looking at this chart you’ll see rand gold is R60,000 higher than this time last year. • US Fed meeting to decide on interest rates – The US federal reserve bank is meeting to decide on interest rates. Whilst it was earlier thought rates would increase the markets now believe interest rates will remain steady. Steady (or lower) interest rates is a positive for gold. If the long term expectation changes to one of steady or lower interest rates more upside for gold is expected. Could this be the start of a new bull run for gold? After dropping to a new low, upon low following its brief stint at $2,000 it looks like gold could be at the start of its first uptrend in years. A US based report suggests this could be the case. As traders buy more and more gold, its price rises. As they sell gold, its price falls. Now the report I’ve discovered shows the levels of trader buying and selling of gold. It is called the ‘Commitment of Traders’ report. 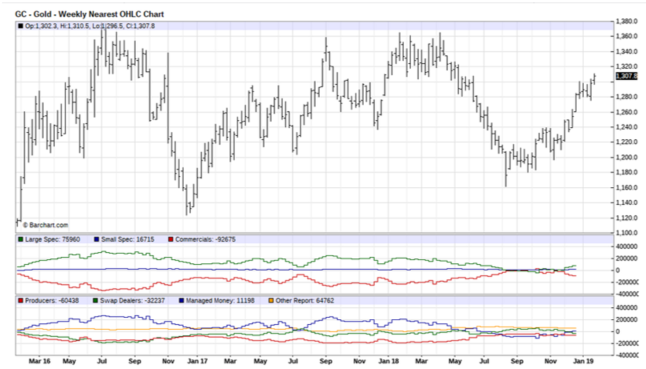 Based on the COT report, we see that the downside in the gold price is extremely limited. How can we know? Look at the positions of the largest market participants (middle pane). The number of long contracts is at the lowest point in 9 years (red bars). This is not only historically low, it is even exceptional. 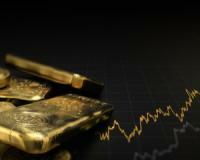 It suggests that the downside in the gold price is extremely limited. As traders again start piling in and buying more gold from these levels where they own very little – the gold price could see an exponential increase. • The one investment that gives you quadruple the return of any share and is safer than bonds! If gold rises from here to say $1,600 that’s a 23% or so rise. That’s good – but you can make more. Take for example a gold mining company that produces 100,000 ounces of gold a year at $1,000. At $1,200 it’s annual profit is $20 million. At $1,400 it’s annual profit is $40 million and at $1,600 it’s annual profit is $60 million. Simply put – a 23% rise in the gold price could see some gold miners increase their profits by 50%, 100% or even more! I’ve tipped just such a gold miner in my latest report to Red Hot Penny Shares readers. This company just completed a new project that will increase its annual gold production by as much as 50%. It’s also grown production at one of its mines significantly in the past year. And it’s set to lower mining costs as well.